Sega's Time Traveler was quite the attention-grabber when it hit arcades in 1991. It had no screen! Instead, holographic characters strode across its three-dimensional stage, projected into the air as if by magic, telling the tale of a heroic cowboy fighting opponents across time. (And occasionally taking time off during attract mode to remind prospective players that winners don't use drugs.) The gameplay was extremely limited and clunky, and it was ludicrously expensive to play ($.75 at my arcade), but wow! Holograms! 3D! The next year Sega followed up with Holosseum, seeking to combine holographic visuals with the fighting game craze newly ignited by Street Fighter II.. Terrible vistas open before you, wrought in agonizing lines of crimson light blazing against utter sepulchral darkness. They sear your eyes like a thousand red-hot brands, their inhuman geometric precision a mocking counterpoint to your own bewilderment. You look to your left, then to your right, frantically seeking some refuge, but in vain. Beyond this hellish incarnadine abyss there is nothing, nothing except the burning pain in your eyes and a growing cramp in your neck and the terrible awareness that somehow you chose this. Welcome to the Virtual Boy. 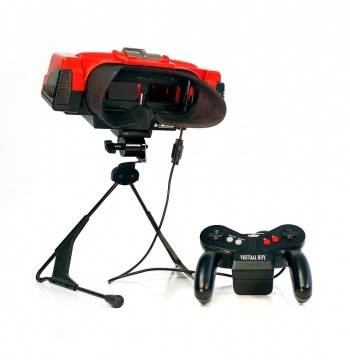 More prosaically, the Virtual Boy was a "portable" 3D game system released by Nintendo in 1995. It was a rare misfire by brilliant designer Gunpei Yokoi, the man responsible for (among other things) Mario Bros., Metroid, the Game Boy, launching the career of Shigeru Miyamoto, and inventing the D-pad. Even the greatest of us have our bad days. It was a bulky headset worn over the eyes, nominally portable but so heavy it was supported by a tripod. Two LED displays provided separate streams of images to each eye in now-familiar fashion, without the need for a shutter system. A visor/shield blocked the player's peripheral vision. Instead of conventional displays with pixels arranged in a grid, it used 1x244 linear arrays, which were then turned into a full field of pixels by reflecting them with rapidly oscillating mirrors. This system had problems dealing with multiple colors, and the green and blue LEDs needed for a color display would have been costly, leading to the most distinctive visual feature of the Virtual Boy: Everything is red. Bright red on black, to be more precise, which is exactly as pleasant to stare into for prolonged periods as it sounds. Combined with the potentially disorienting 3-D effects and the awkward posture often needed to look into the device properly, playing the Virtual Boy could be a physically punishing ordeal. Users complained of eye pain, headaches, nausea, dizziness, and neck soreness. It was bad enough that the Virtual Boy provided warnings to take a break every 15 to 30 minutes, lest the abuse it inflicted on its users overwhelm them completely. Those stalwart souls willing to endure this could choose from a library of three games at launch, expanded to 22 by the time of the system's demise. These included pack-in game Mario's Tennis and such killer apps as Nester's Funky Bowling, Bomberman: Panic Bomber, and Waterworld. The Virtual Boy does bear the distinction of having the first Megami Tensei game released outside in America (a year before Persona) in the form of Jack Bros. Virtual Boy did about as well as you'd expect a system that physically attacked players to do, vanishing from the market and back into the abyss from whence it was birthed after less than a year.